Bgo Casino provides a great selection of games, ranging from the finest slot games around to exquisite live casino table games. All tastes are accounted for. Deposit options include some of the most popular and easy for use payment methods. The customer support ready to help 7 days a week. 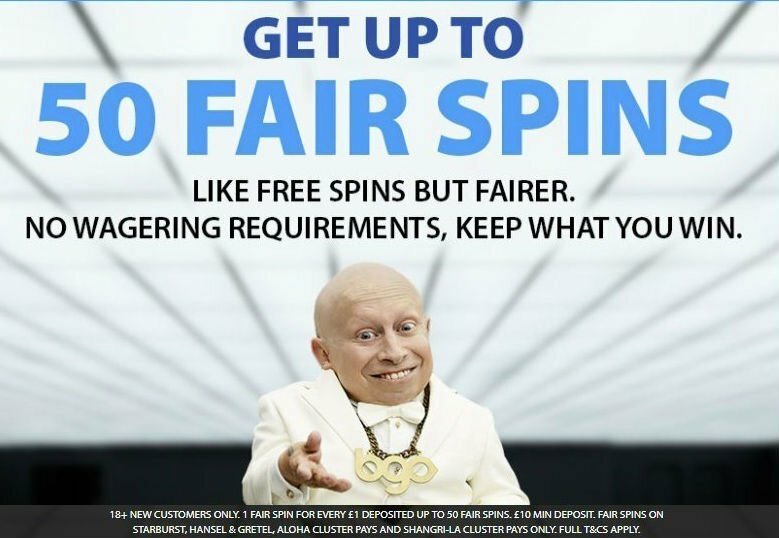 And lets not forget about the famous BGO Fair spins bonus. This flash based browser casino is definitely worth a visit. 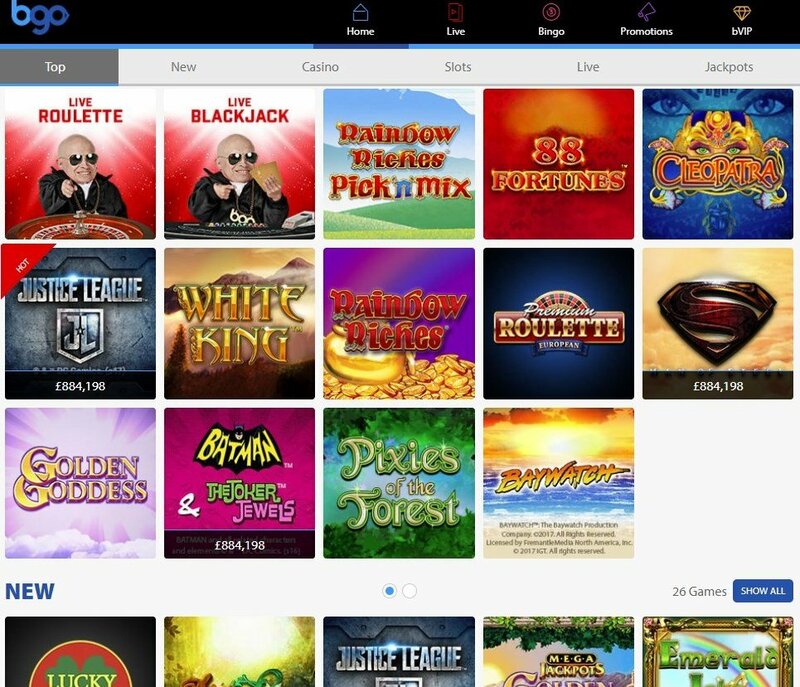 Having spawned from Xbingo, Bgo Casino developed its online casino in October 2012. Owned and operated by BGO Entertainment LTD, Bgo Casino is licensed and regulated by Alderney Gambling Control Commission, as well as by UK Gambling Comission. Registering for a Bgo casino account couldn't be simpler, there is even the option to sign up using your Facebook account! Currently only available in a flash based browser version, Bgo Casino Mobile is also available to most smartphone and tablet brands. Launched in June 2013, it marks a new age for the simplicity and playability Bgo Casino players can enjoy. Sign up at bgo and watch your Boost Bar fill up as you play. Each time it’s full, you move up a Level and unlock 1 new Boost. The Boss will drop your Boost into your personal store, called The Vault. With an innovative approach to the software Bgo Casino runs on, it takes what it wants from where it wants, concentrating on offering you the best of the best. It takes its favourite games from all the big software players and, in this way, will attract the casino connoisseur. In Bgo Casino, you will find all the table games and, there's even a pretty handy playing guides to help you get the most out of your playing time on the range of Bgo Casino games. Get ready for handpicked slot favourites from Microgaming, IGT, Sheriff Gaming and many others. Bgo will give you the ultimate live entertainment in spinning those roulette wheels and dealing your cards, with a live casino fit for the more socially inclined amongst us. You will even be able to enjoy the nifty feature of watching other players, just like a real brick and mortar casino. Being a purely flash based browser experience, graphics are mostly based on your internet speed so, whilst playing Bgo Casino, it is an idea to close any bit torrent downloads for maximum graphic pleasure. Bgo's mobile version supports all the slot games superbly but, some of the table games are best played on a larger screen for the ultimate enjoyment. Bgo Casino has a reputation for running generous and truly original promotions that quickly win the hearts and minds of existing and prospective players. New members are welcomed with a special bonus that consists of 50 Bgo fair spins based on their first deposit. For each dollar invested, the casino will offer 1 Fair Spin up to a maximum of 50 such bonus rounds. These are truly remarkable because they come with no strings attached, have no wagering requirements and no maximum winnings ceiling. Regardless of how successful they are with redeeming and converting the Bgo fair spins into cashable money, players have many more opportunities to win down the road. The Vault will reward perseverance and players who wager real currency on any of the games available will unlock Boost Rewards as they play. Loyalty is also rewarded with points that help players move up the occasional Bgo leaderboards. For the fans of table games, The Boss’ Live Casino is the place to be and new members receive up to £5 worth of Golden Chips as a welcome gift. Those who play blackjack will be lavishly rewarded if they manage to Beat The Boss’ Hand with a Five Card Trick. The Blackjack Bonanza is another popular promotion for the fans of this game and it rewards £5 cash if players hit 2 consecutive hands. Slots remain the most popular games at Bgo Casino and not surprisingly, there are special promos for their fans. $300,000 is up for grabs in the Justice League giveaway for those who play Bgo’s best DC Comic slots. It is nearly impossible to find any sort of customer service contact details until you have signed up and, once registered; it takes you to the deposit page automatically, still without giving you any contact details for queries or questions. You can deposit to Bgo Casino using a debit or credit card, Paypal, Skrill or Neteller. Once signed in and topped up, you will be able to easily see your loyalty points, achievements, real balance and bonus balance. You will also then find the mysterious contact us button and be able to fill in an online enquiry form, write a letter that will take 7 working days to be received or live chat, during business hours only. 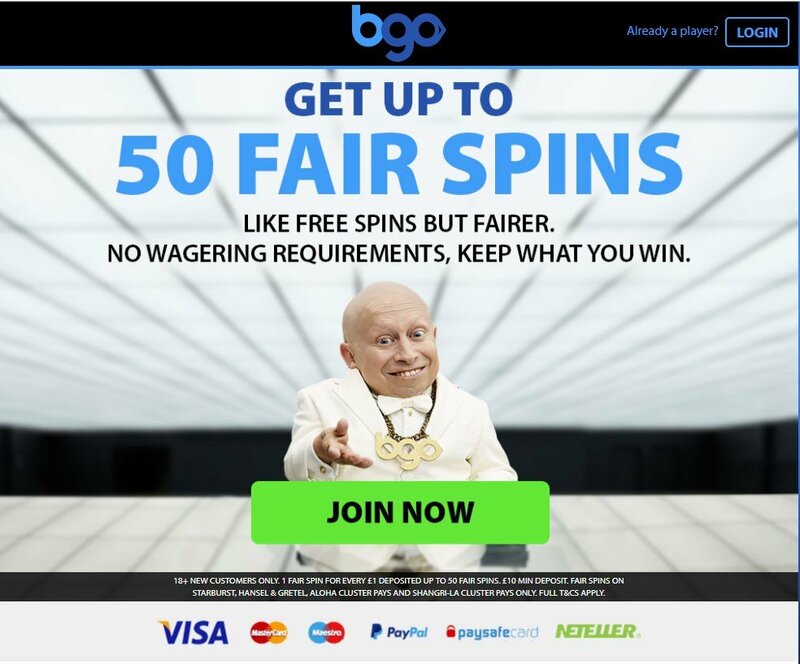 I love the marketing campaign that BGO is running at the moment, I am a big ‘Mini Me’ fan!